"MEET PERRY L. CRANDALL. HIS IQ IS 76 BUT HE'S FULL OF WISDOM -- AND HE'S JUST WON THE LOTTERY. SEE THE WORLD THROUGH PERRY'S EYES AUGUST 2. Ingram Advance is a catalogue that book sellers get. They featured me in New Voices in the August issue. So I would talk to you some more but I have to go to the laundry room. And use it for its intended purpose. I am reflected in Baby Horse's gaze and as he watches me, I see the world through his perspective. I become him. I see who he is. Do you see who I really am? 6 am and 79 degrees. 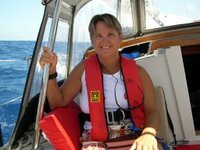 Check out SUSAN WIGGS' BLOG for some yummy recipes and an even yummier book coming out (DOCKSIDE)! I am touched and gratified but is this the person I really am? What do I look like to the outside world. Will a reader want to know me. Read what I write? Do I seem normal or larger than life? I read about this person and it feels surreal. Do I know her? She seems familiar. Next week at this time I will be on my way to Portland. So I thought. Gee, I can call bookstores, introduce myself and maybe arrange to sign a few copies of stock. This is what other authors recommend as a good way to make connections. ME:"My name is Patricia Wood and my book is coming out next week. LOTTERY, Maybe you've heard of it? UNNAMED OFFICIAL SEMI REPRESENTATIVE OF UNNAMED GIANT BIG CHAIN BOOKSTORE: "um uh you know we can't have you do that because on POD's we can't return signed copies." ME:(only slightly deflated) oh, but my publisher is Putnam. LOTTERY released by Putnam? UNNAMED OFFICIAL SEMI REPRESENTATIVE OF UNNAMED GIANT HUMONGOUS BIG CHAIN BOOKSTORE: (insert sigh and probable eye rolling but of course you can't see that through the phone - consider it physical head hopping) "Hmmm...they don't usually do POD. It doesn't sound familiar. What did you say your name was again? I don't think we're ordering your book..."
ME: (voice becomes squeaky)"but...but...but...I'm an author from Hawaii!" UNNAMED OFFICIAL SEMI REPRESENTATIVE OF UNNAMED GIANT HUMONGOUS GARGANTUAN BIG CHAIN BOOKSTORE: "Now dear...we can't order EVERY book now can we?" 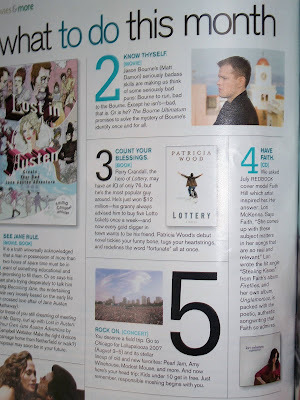 So even though articles about me may be appearing in papers and magazines. I am still the same...taking out the garbage, sticking those yummy microwaveable meals into my oven and cleaning kitty litter off my floor. The tag says the UK. Let's open it shall we? The export version of LOTTERY. 8:45 am and 80 degrees. I have been up since 4 am. I had an interview at 5 and will have another at 10. And I just realized that LOTTERY will be released in exactly one week. So how are radio interviews done? Well it takes a land line. Complete quiet. And a washer and dryer. 82 degrees and 9:23 pm. I had my pen, my paper, my books. And mary. Chief photographer and security detail. As soon as the radio personality (that's the new word for DJ's) called on my cell I yelled at Mary. "Keep everybody out!" She tried. Oh how she tried. People walked by with boom boxes. All the fishing boats in the front row revved their engines. Mary had to take a quick break. While she was gone two of my marina friends walked in and started chatting. I waved my sign. "QUIET! RADIO INTERVIEW GOING ON NOW!" "Now?" they asked. "Cool are you on the radio live now?" "Hey mom!" one waves. The other jabs them in the side. "It's radio. I don't think they can see you." I talk to the radio personality while I frantically pantomime choking them both. Mary runs in and yells, " SHHHHHHH!!!! Thank goodness the wonderful world of radio allows some editing. I have no idea what I said. I hope I was coherent. Bloggers in Seattle? Listen to KRWM FM Sunday August 5. Then let me know how I did. THIS POST IS FOR DORIAN BECAUSE THERE IS SUCH A THING AS A DREAM AGENT. My manuscript of LOTTERY was being read by three agents. I already had interest from editors who had seen LOTTERY on the Maui Manuscript Marketplace. My top pick, Dorian Karchmar from William Morris Agency, had called to ask for more time to read. "Just one more week?" She asked. She emphasized she wanted to hear about any offers from any of the other agents who were currently reading LOTTERY. That was a week and a half ago. 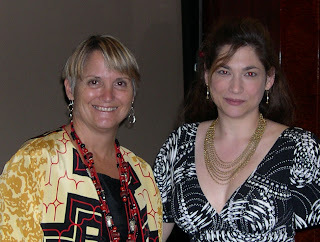 My friend and author Holly Kennedy said the faster that agents got back to you the better news it was. This was not good. I was losing hope and was planning to get my second tier agent list out and rethink. My phone sat on the Nav station charging. I leaped out of bed. I hit answer but the call went straight to voice mail. The area code was 212. I listened to the message only long enough to hear, "I LOVE your book!" I have two cats retching hairballs between my feet. My husband has an early meeting in the office. I assure Dorian that I can talk while grabbing a paper towel and wiping cat vomit from the bottoms of my bare feet. I try to be professional. Like it wasn't the most important call of my life. Like it didn't make all my dreams come true. Like it didn't mean my time spent writing was not wasted. It was as I always imagined. It felt just as I knew it would. "My agent is Dorian Karchmar of the William Morris Agency." And it feels just as good a year later. MY FRIEND RICK IS SAILING HIS SAILBOAT WIND MAGIC ACROSS THE PACIFIC. As a going away present I gave him an autographed copy of LOTTERY. It's appropriate don't you think? LOTTERY has characters who love boats and sailing. It also gives Rick's crew something to read on one of the longest passages you can make on a sailboat. I helped them cast off lines and followed them around to the back of ORION taking pictures. Less than two weeks before its release date LOTTERY is being shipped out by BARNES & NOBLE and is garnering reviews like this one M G Tarquini did on SPINE TINGLER . My novel and I are on a passage too, just like Rick and WIND MAGIC. Out the mouth of the harbor. Not knowing what will happen. "Sailing vessel Wind Magic requesting out bound clearance." The voyage has begun. It could take three weeks, maybe four. The weather will be unpredictable. Gale force winds or utter calm. And my friend Rick and I? When will we meet up again? We will meet on September 16 at my library reading. Because you see, Rick is on his way to Everett. Baby Horse has all four feet off the ground. Kind of like his owner. Counting down to the release date. 9 pm and 81 degrees. I got REALLY GOOD NEWS...MIA KING will make her way from the Big Island to be at BestSellers at noon downtown Honolulu on the big day August 2. I am picking her up at the airport at 9 am and she promised to be my Number one super duper helper. She will be assisted by the Number one extra ordinary helper Mary who will then be assisted by the Number one very outstanding helper Lisa R.
FYI:THIS IS WHY THERE IS CAT HAIR ALL OVER MY BOOK SIGNING CLOTHES. FUNNY STORY- or maybe a lame story depending on your attitude. So I get a call that I should prepare to do an on air interview for radio via phone. Publicist:"This is a great! An interview for radio stations XYZ." Publicist:"You have access to a land line don't you? Live Radio requires a land line." Me:" Uh." (remember I live on a boat) "let me work on that." I find out that many companies including my husband's do not have land lines. Me:"You guys have a land line?" Harbor:"No but there's one in the laundry room. You can buy a cheap phone and plug it in. Only one problem." Harbor:"We don't know the phone number there." This is where I was inspired. I called my cell phone from my new phone in the laundry room and presto! The number came up on my cell phone. My publicist was VERY HAPPY. And Number one extra ordinary helper Mary? What will she be doing next Tuesday between 3 pm and 4 pm? She gets to guard the laundry room door and chase everyone away until my interview is over. Radio Personality:"What's that noise? It sounds like a dryer." 730 PM AND 84 DEGREES. I asked Manic Mom to remove 2 names from the hat. I expected maybe 15 entries. I had no idea that so many of you would want to enter my LOTTERY contest. I sent emails off to the lucky winners and asked them to send addresses so they get their stuff PRONTO!!! We will do THAT again! So about 17 more days to go until my first signing at BestSellers in downtown Honolulu. What would you do while you waited for the release date of your first book. 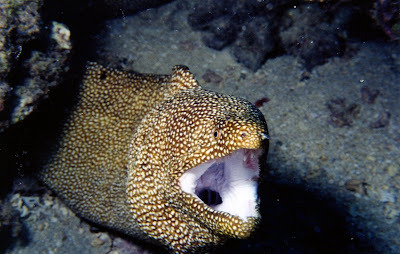 So what does this eel have to do with being an author? Read further and find out! THE WRITERLY PAUSE group in California. Note: They ate in front of me the entire time. But I did have a blast talking to them! gmail is lovely but it limits what I can do. I'm not interested in doing the spam thing. I want people on my list that want to hear from me. Please if you haven't already - email me at patricia@patriciawoodauthor.com so you are in my address book. I don't want to lose anyone! "Send me a copy of your book!" "I didn't know you wrote a book!" 4. Helping manic mom's blog do the contest - it is her Kuleana (as we say in Hawaii) I just had to make sure she got the list for whose entered for the drawing. 5. 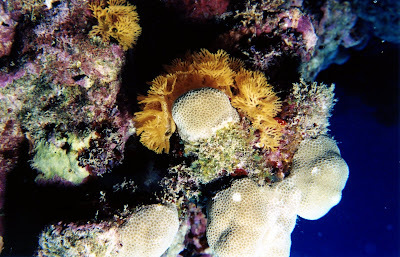 Finalizing my new website PATRICIAWOODAUTHOR.COM and driving the webmasters CRAZY (Kaha and my husband) with my continual little changes! 7. Googling LOTTERY PATRICIA WOOD. 8. My neighbor knocking on my hull ("Did you know your sump has been running for hours and no water has been coming out?") EEEEKKKKKK!!!!! How are all these like a moray eels open mouth? Check to see if you are listed. If you are not then follow the instructions posted there. Drawing is on manic mom's blog Sunday. 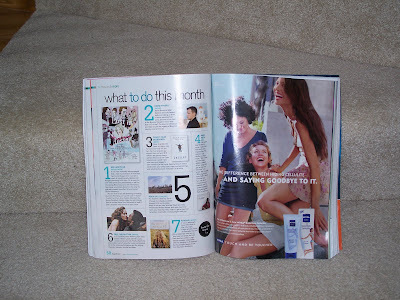 PAGE 50 August Issue of Redbook!!!!! Thanks to my faithful and vigilant blogger buddy. you are the UBER BLOGGER FAN!!! THE TRANSFORMATION IS COMPLETE MY NEW AND IMPROVED WEBSITE IS DONE. Tell me what you think. There will be continual changes and updates. 82 Degrees and 11 pm. I got a call from Channel 2 news. They'd like to do a feature on me. 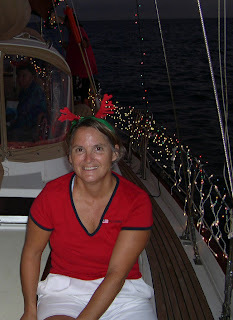 When an author lives on a sailboat where do you suppose they want to do the interview? The first thing I saw was the camera. I started salivating. It was the largest camera I had ever seen. This is Ron Mizutani UBER JOURNALIST. He was able to capture who I am as an author and what LOTTERY was all about. I tossed my head. Smiled. Fluttered my eyelashes. And when they left I collapsed from the strain of holding my stomach in for all that time. I had to take a nap. Then it was time to see me on TV. At this point I demonstrated by utter lack of sophistication. I took a picture of me on TV. On the classic scale of nerditity. Another day chock full of adventure and fun. Speaking of fun... A READERS GROUP CONTEST that is being held by my publisher! So how do you distract yourself when your book is coming out in three weeks? You think about the ocean. That's what. 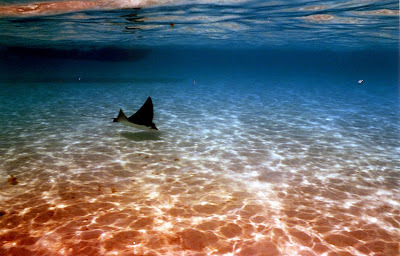 This eagle ray was skimming along the sandy bottom. He has a plan. A mission. Searching for edible crustaceans. Kind of like writers hunting for that perfect premise. That solid story. Almost midnight and 83 degrees. What am I doing up this late? Writing of course. What else? There are many important considerations when planning for a book release. First of all for the signing you have to get a really good pen. My trusty friend Holly Kennedy supplied just the perfect implement. Do you know how hard it is to take a photo of yourself writing? I think this turned out quite well considering. This one has heft and a way cool feather on the end. You have to collect fortunes. Tomorrow I will talk about the details involved in planning and organizing book signings, book launch party and traveling to promote your book. I would do it now but I am tired. I have hand cramps from practicing my signature. YOU'VE HEARD OF WHERE'S WALDO? Today you are going to learn about release dates. NOTE: More Reviews. Check them out. It's not official yet but it's happening. 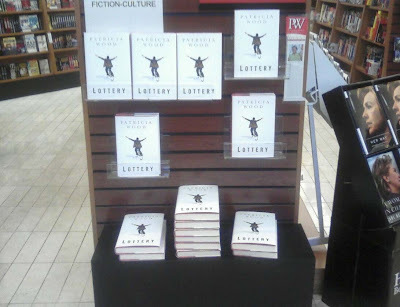 LOTTERY is on sale in bookstores. A vigilant blogger and her handy dandy camera phone took this picture. At first I was perplexed. Is this OK? Will the publishing police come out of the woodwork and require the book store owner to do extra book reports? So I did what every self respecting author does. I sent an SOS message to my editor. "LOTTERY IS ON SALE!" I said. "WHAT GIVES?" no one is supposed to have a copy, or open a box, prior to the on-sale date. bookstores are expected not to sell the book prior to the on-sale date. Hosseini would have strict on-sale dates). mouth prior to the official on-sale date. sale two weeks in advance of pub." Well now I know. It's OK! It's good! It's GREAT!!!!!!! So where is it on sale? I will let you guess. Go down to your neighborhood bookstore and LOOK. And while you are looking...ruminate on these. A nice mention by LITERARY LOTUS. "YOU'D HAVE ME DOWN ON MY KNEES...BARRACUDA..."
I have always been a fan of Heart. NOTE: THE VERY FIRST SUPER DUPER LOTTERY CONTEST ON SIDEBAR. QUESTIONS ABOUT RULES? ASK THEM IN THE COMMENTS SECTION! Writers second guess themselves all the time. It happens. I read author interviews. Features. It's there between the lines. When you worry about what others think. Worry about being good enough you can be paralyzed. I am reminded of songs. What animal do you become when you want to persevere. To outlast. To be strong? And then it hits me. 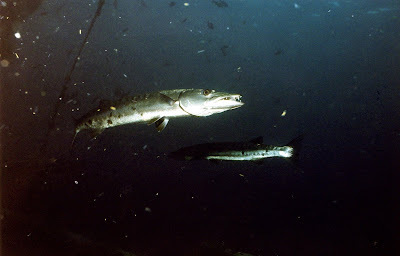 It occurs to me who the Barracuda really is. Because you get presents on Christmas. AUDIO CD NARRATED BY PAUL MICHAEL WHO DID DAVINCI CODE!!!! I put it into my computer and hit play. And Perry L. Crandall's voice came out exactly as I imagined it. Tears running down my face. I played the first chapter and the last. It was PERFECT! I am a Paul Michael fan. So I recommend any and all Audio CDs that he does. Do you give the ending away in your synopsis or don't you? That is the question. My own personal-without-merit-opinion is no. I see this circular argument on ALL writing/querying message boards. BUT. BUT. BUT. I wanted an agent to read my full manuscript when I was querying. I told enough to get them interested but not too much. I felt so so so sorry for poor manic mom. She sounded so excited I put her out of her misery and....(drum roll) AN AUTOGRAPHED COPY OF THE REAL DEAL LOTTERY is on its way to her. I emailed her back telling her this as she was SO dutiful to ask to be on my mailing list. This was my top secret contest NOBODY knew about -- not even me at first. Her responsibility is to give a play by play description of her waiting for LOTTERY...opening up the package...and her emotions as she reads...and then? A review. GIVING NOTHING OF THE PLOT AWAY. Let's talk about these pesky synopsis/hooks.